Cycle Chic went for a bike ride in San Francisco the other day. Coincedentally, several thousands happened to do the same thing at the same time. What are the odds? 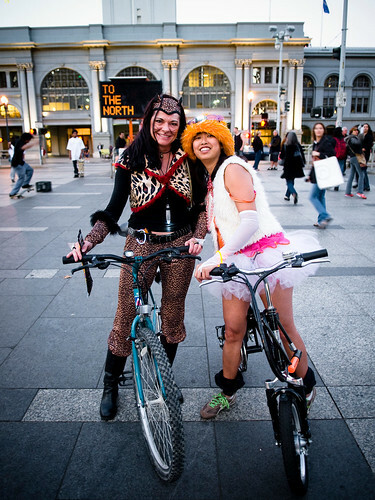 It was Halloween Critical Mass in the city by the bay and what a night it was. We all gathered at Lower Market Street before setting off. Great mood. Wow - looks like good fun. Were the bananas on bikes too? everybody was on bikes. including the fruit. 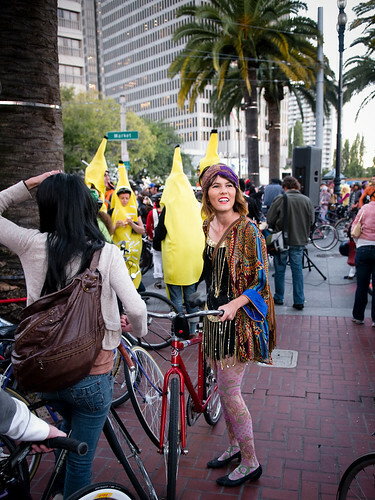 lots of fruit in San Fran, and also in Toronto, looked like a blast! It was wonderful that you could visit us and that we could meet and speak with you on bike issues local and abroad. In Berkeley our Critical Mass is creating a new approach to increasing ridership that is more in line with how CCC promotes bicycling. Your visit was most welcome!